If haven’t heard yet, Visme is in a new phase of growth. 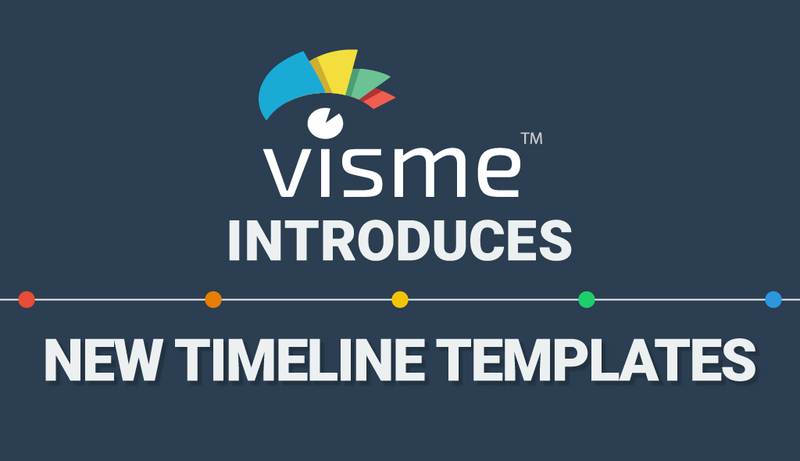 Not only have we released our most important upgrade to date--after completely revamping the Visme editor from the ground up--we’ve also rolled out 70 awesome templates and hundreds more are on their way in the coming months. Some of the new infographics that have been released in the past weeks include a set of timeline templates with a variety of themes. From brand stories to historical timelines, these time-based infographics can be used to display information in a visually appealing chronological format. In this post, we cover some of the key features of these new timeline templates and provide some ideas for how they can be creatively used within your organization to catch your audience’s attention and communicate more effectively. Before we dive into the details of each of the new templates we’ve released, you should also know that we’ve made it much easier for you to find exactly what you’re looking for. Once you’ve created your new project, you’ll see a new search bar in the Infographics category, along with keyword suggestions to the right of it. Or choose one of the categories to the right, which have been created based on the theme of the visual (marketing, education, business) and the type of infographic (timeline, comparison, reports). Now that you know how to find what you’re looking for, here’s a rundown of some of our new templates, which you’re sure to enjoy. 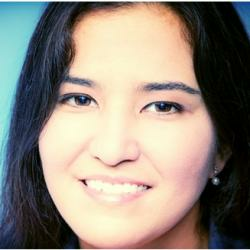 A proven way organizations can engage their audience members is by humanizing their brands. And one of the easiest ways to do this is by telling your organization’s story. From the day it was conceived to the major obstacles encountered along the way, the major milestones in your brand story should weave--like all good stories--a riveting plot with its own characters, conflicts and resolutions. 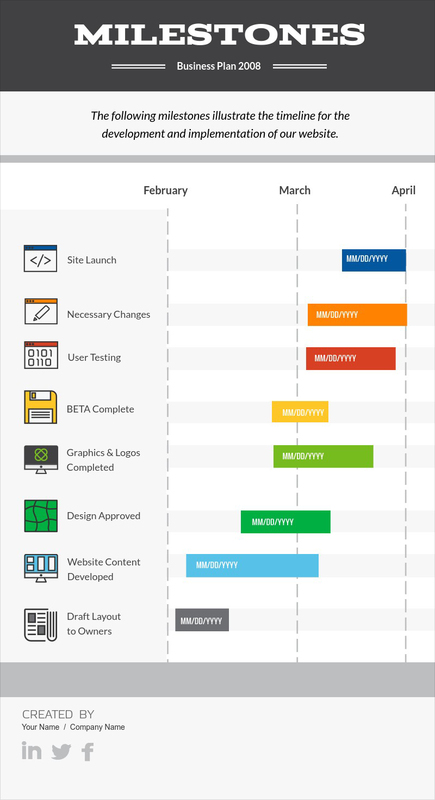 You can insert your own dates and events in this vertical timeline, as well as modify the colors, replace the icons and choose other fonts to fit your content and design needs. Also, you can highlight company awards and achievements in the bottom part. If you’re looking to tell the story of a software or tech-related startup and don’t have the time to modify color schemes and fonts, then this template might be a better fit. As with the previous vertical timeline, you can insert your own text and icons. Also, if you need to delete or add more milestones to your infographic, you can simply click and drag the button at the bottom of the infographic to easily adjust its size. 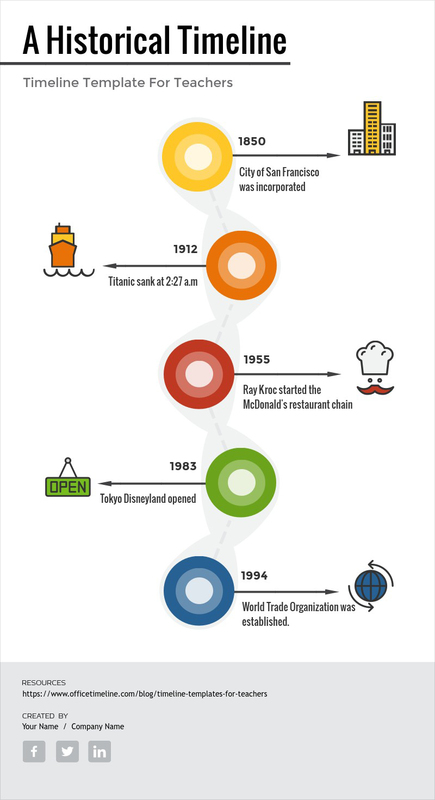 Infographic timelines are also ideal for use within a classroom. Whether its purpose is to visualize the history of the modern computer or provide a visual chronology of the history of the Roman Empire, a timeline template can save both teachers and students much valuable time. For online marketers and social media managers, a timeline template with all the major milestones in the evolution of the most prominent social media platforms may also be useful. Designed with outline icons and a neutral white background, this infographic can be easily modified with your own information and dates. 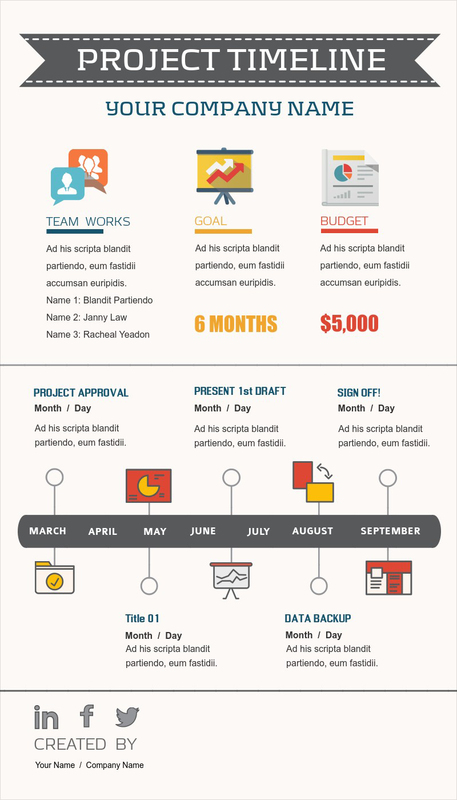 For those looking for a month-based (rather than year-based) timeline, there’s also this professional-looking, monochromatic infographic with several milestones, which can be replaced with your own information. You can also create horizontal templates with Visme. 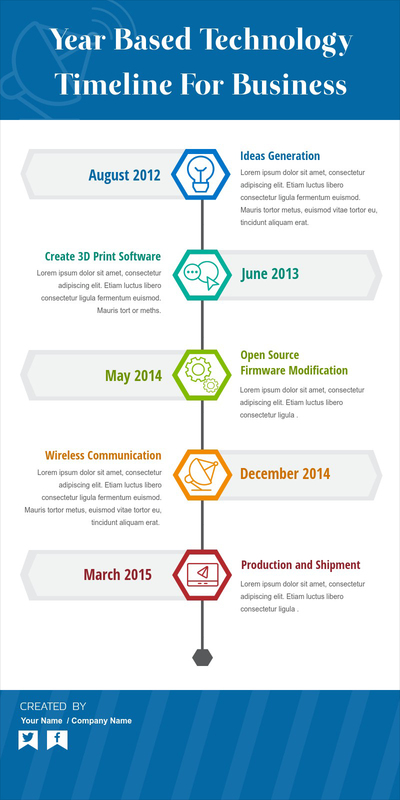 More than a handful of these have been added to our selection of timeline templates. For example, you can now find this horizontal timeline within Visme. Designed to be used as a short-term project timeline, with less than 10 data points and a month-to-month account of important events and dates, this horizontal timeline can be complemented with additional project details such as end goals and budget totals. Here is another bold, colorful horizontal timeline that can be used to detail important project events and milestones using several data points, illustrative icons and short paragraphs of text. 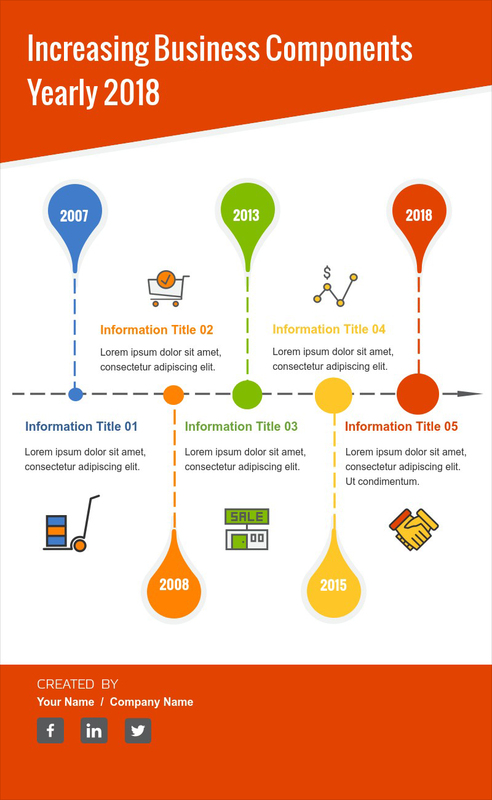 For those looking for a timeline template with a greater number of data points, there’s also this eye-catching infographic with various explanatory paragraphs below the timeline. Another popular format for a project timeline is a Gantt chart. This is simply a specialized type of bar chart that illustrates the end and start dates of different elements of a project. Its colorful icons and small amount of text make it extremely easy to understand and commit to memory. There are a handful more timeline templates not showcased here, but you can browse and find the perfect one for your needs by visiting www.visme.co. All you have to do to create your account is insert your name, email and password, and you can start creating your own infographic timeline right away for free. Beautiful! 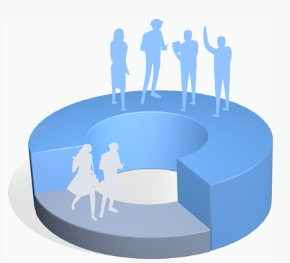 Going to check this tool out for making infographics..love the concept! Thanks for the feedback, Justin. We’d love to hear what you think of it. They look so awesome! I was thinking about creating a timeline infographic with this service – http://www.timelinewebsite.com/create-a-timeline-online-with-our-developers/ but now, now I feel so inspired to create it myself with these beautiful templates. The problem is, I don’t know which one to choose. I definitely gonna register here. Hi Elisa. Thanks for your feedback, and I hope you found it useful. Any questions, just let us know.